We’d seen the trend in Windows 7. When we evolved the taskbar we saw awesome adoption of pinning [applications] on the taskbar. We are seeing people pin like crazy. And so we saw the Start menu usage dramatically dropping, and that gave us an option. We’re saying ‘look, Start menu usage is dropping, what can we do about it? What can we do with the Start menu to revive it, to give it some new identity, give it some new power?’ …So I’m a desktop user, I pin the browser, Explorer, whatever my apps are. I don’t go the Start menu as often. If you’re going to the Start screen now, we’re going to unlock a whole new set of scenarios, or you can choose not to go there, stay in the desktop, and it’s still fast. You can’t beat the taskbar. While this might be easier for beginners to adopt, it tough for regular Windows users to digest. If you have upgraded or purchased Windows 8 recently and got frustrated seeing the lack of Start Screen in Windows, I have a solution for you. Use Win8Starter; its a software developed by Engelmann GmbH, to get back to you the magic of Windows Start Menu. Now you can avoid the complicated ways of launching a software, turning off computer etc. Win8Starter is no hack! Win8Starter runs as separate program instance; no system files or registry entries are configured, deleted or changed. The familiar start button and a start menu are available again on the Windows 8 desktop! Like in the past: Expand your Win8Starter menu easily per “Drag & Drop” by your own program links. List of most frequently applied programs and functions. All program entries can be moved and arranged anew. Also included: Your familiar user folders and the direct links to system folder and –functions like ‘Documents‘, ‘My Pictures‘, ‘My Music‘ ‚ ‘Computer‘, ‘Control Panel‘ and ‘Printers and Devices’. No complicated switch-off of Windows 8! Select as usual and directly via the start menu between the options like ‘Shut down‘, ‘Lock‘ and ‘Restart‘. All the programs and files that the user requires become faster and more directly accessible! All functions can be adjusted conveniently via the Win8Starter settings dialogue, among them the fade-in and fade-out of start menu buttons! The dialogue offers nearly all the settings options that you know from older Windows versions. Full text search with intelligent pre-search, which in most cases shows the results under the installed programs and documents when entering a term. 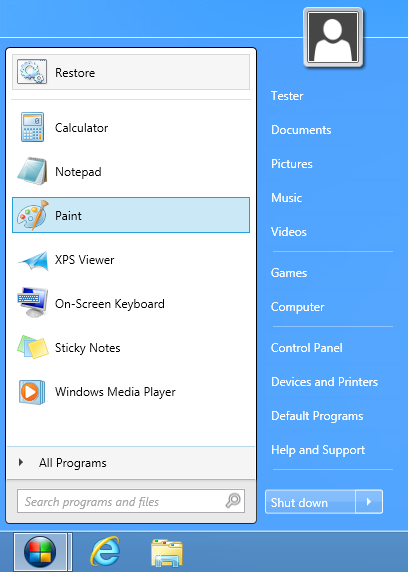 Furthermore, (compared to Windows 7 start menu) you can add the following useful Windows programs to the button bar: Calculator, Editor, Paint, Task manager, Registry Editor, CMD, Adaptive, System information, System configuration, Explorer and Remote Desktop connection. Uniform look: Win8Starter automatically adjusts to the set window color of Windows 8. Win8Starter comes both Free and Pro version. In the free version, there are no settings. no automatic adjustment of menu color; no possibility to add your own shortcuts. The free version can be downloaded from the following link. The pro version can be purchased at a low price of $ 5.99. This entry was posted in Free, OS Enhancement, Software, Windows and tagged Metro UI, Start Menu, Windows 8.